This Temblor map shows the complex network of faults across the Bay Area. Of all of these faults, the Hayward Fault has the highest probability of rupturing in a M=6.7+ earthquake in the next 30 years, according to the USGS. 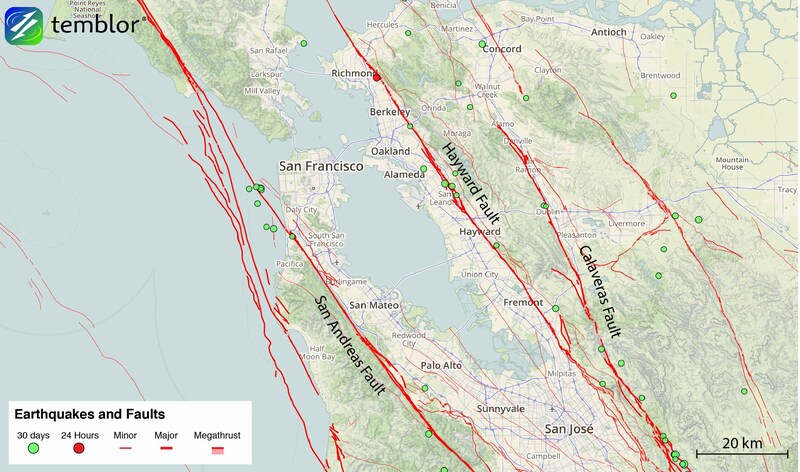 For residents of the San Francisco East Bay, the greatest seismic hazard is the Hayward Fault. As this nearly 80 mile-long fault snakes its way from just east of San Jose to San Pablo Bay, where it transitions to the Rodgers Creek Fault, it cuts through the cities of Hayward, Fremont, Oakland and Berkeley. While the Hayward Fault may not have the notoriety of the San Andreas, it is part of the same larger fault system, and according to the USGS, has a greater chance of rupturing in a large earthquake by 2043. The USGS says there is a 33% chance the Hayward ruptures in a M=6.7+ earthquake by 2043, while the San Andreas has a 22% chance. This difference is mainly due to the fact that a large earthquake last occurred on the Hayward Fault in 1868, and because the interval between the last five major quakes is 140 years (This year is the 150th anniversary of the 1868 quake). Therefore, all residents of the East Bay must be aware of the hazard that lies below their feet. These three slides show shaking within the Bay Area 9, 10, and 40 seconds after the start of the simulated Hayward Fault earthquake. What should be highlighted is that there is significantly higher shaking in the East Bay Hills due to weak rocks, and that even 40 seconds after the earthquake, areas like Livermore are still shaking as it lies in a sedimentary basin. 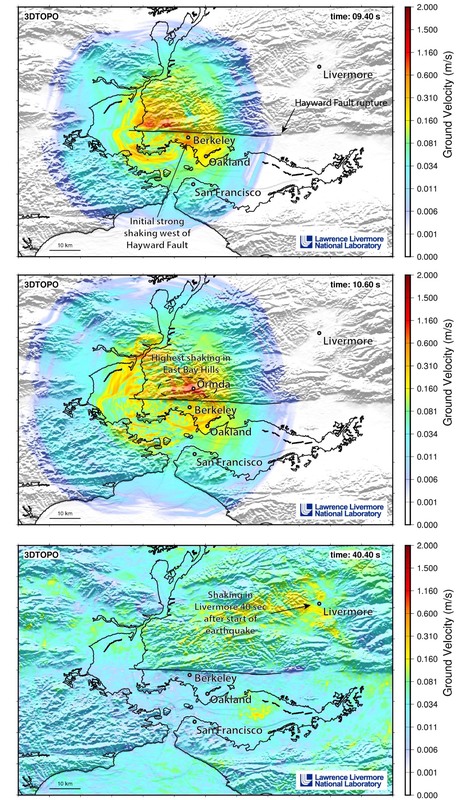 One of the major findings from this simulation is that east of the Hayward Fault, in the East Bay Hills, significantly higher ground motions were recorded, primarily due to the geology of the hills, which are comprised of weak sedimentary rocks. This should be of concern to residents of the area, as a major earthquake would cause significant damage to structures and lifelines, as well as major economic and social disruption. Furthermore, strong shaking within the steep topography of the East Bay Hills means landslides pose a threat to both people and property. Moving forward, the scientists will work to see how different type of rupture scenarios can generate different types of shaking. “We only ran one rupture realization with one hypocenter, so variations in slip distribution and hypocenter (controlling directivity) remain for further study. In fact, I am working on this now” Dr. Rodgers told us. Additionally, Dr. Hudnut added that, “everyone is excited about the prospect of using supercomputers to provide greater realism. What we lack are groundmotion recordings from large historic earthquakes. Instead, we have to piece together fragments of precious data from recent earthquakes, and use that in checking these simulations against reality.” All of this means that the simulations will only get better, including incorporating amplification and liquefaction effects. 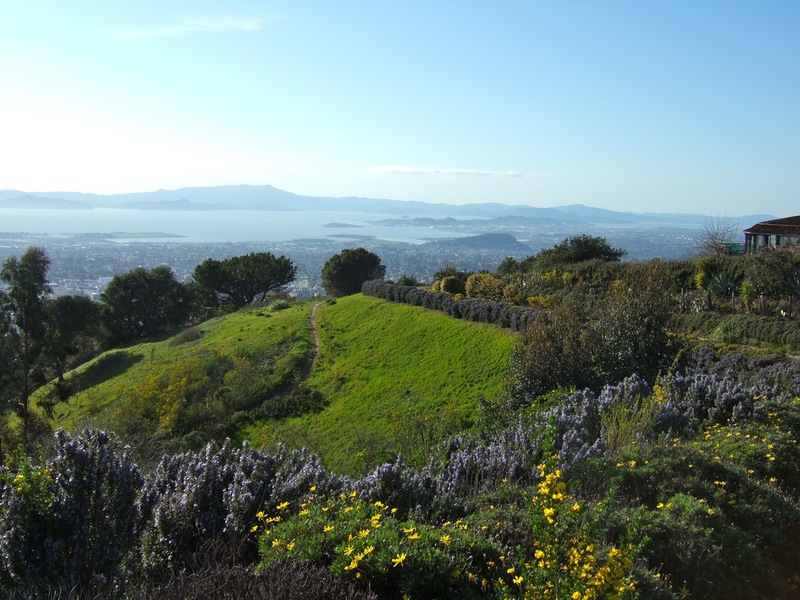 Regardless, for residents of the East Bay, especially those within the East Bay Hills, this study highlights how your location is critical to determining your hazard, as well as the need to understand how at risk you are. Only by doing this can you protect yourself from earthquakes that will happen one day. Recently I have read of new evidence showing the Hayward and Calaveras faults to be connected, effectively increasing the length of the Hayward system. Does this increase the potential magnitude of the maximum credible earthquake?